This blue plaque can be found outside Virginia Woolf’s previous home in Fitzrovia, London. Virginia Woolf was born Adeline Virginia Stephen on 25th January 1882 in Kensington, London. The English writer is regarded as one of the foremost modernist literary figures of the twentieth century. Woolf was a significant figure of the London literary scene and a member of the Bloomsbury Group. Her most famous work includes the novels Mrs Dalloway, To the Lighthouse and Orlando. Woolf also wrote a book-length essay titled ‘A room of One’s Own.’ This is generally regarded as a feminine text and is praised for its argument for both literal and figural space for women writers. Woolf lived in Fitzrovia, a neighbourhood in central London, close to London’s West End. Woolf was thought to be a regular visitor of the Fitzroy Tavern, now home to the London Literary Pub Crawl. George Orwell was the pen name for English novelist and journalist, Eric Arthur Blair. Orwell became famous for his work which raised issues concerning social injustice, totalitarianism and democratic socialism. He is often regarded as the best chronicler of English culture during the twentieth century and ranked second on The Time’s list of the fifty greatest British writers since 1945. Orwell is probably best known for his novel ‘Nineteen Eighty Four’ and novella ‘Animal Farm.’ Together the books have sold more copies than any two other books by other twentieth century writers. Orwell also wrote ‘Homage to Catalonia’ which was an account of his experience of the Spanish Civil War, as well as numerous essays on politics, literature, language and culture. The Newman Arms in Fitzrovia is one of the pubs we visit on our literary pub crawl and is thought to be George Orwell’s favourite place to drink. 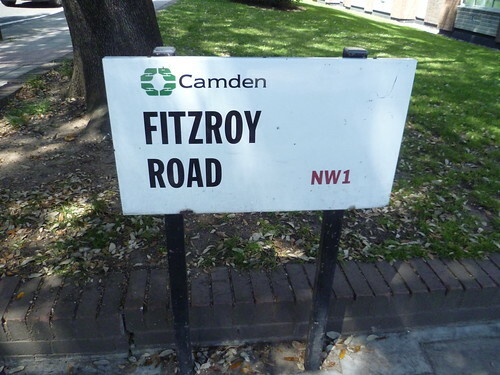 Fitzroy Road is the street that Sylvia Plath lived on before her death. Sylvia Plath was born on the 27th October 1932 in Boston, Massachusetts. Although she was born in the States, Plath is often regarded as a London writer, due to the fact that she lived in the city for a while and died here in 1963. Sylvia Plath is regarded as the poet who advanced the genre of confessional poetry. She is best known for her two published poetry collections, The Colossus and Other Poems and Ariel. In 1982 Plath won a posthumous Pulitzer Prize for The Collected Poems. She is also the writer behind the semi-autobiographical novel, The Bell Jar, which was published shortly before her tragic death. Thomas Stearns Eliot was one of the most famous poets of the twentieth century. He was also an essayist, publisher, playwright, literary and social critic. T.S Eliot was born in St. Louis, Missouri, but moved to the UK at the age of twenty five. At the age of thirty nine he was naturalised as a British subject. Eliot spent the majority of his time in the UK living in London. Some of his most famous work includes the poem ‘The Love Song of J. Alfred Prufrock’ published in 1915, The Wasteland published in 1922, and Four Quartets published in 1945. In 1948 T.S Eliot was awarded the Nobel Prize in Literature. These are just a few of the famous writers that resided in the city of London over the years. If you are a writer or are interested in finding out more about the literary greats, London is the best place to visit.